Caribbean Journal is putting the focus on the beaches of the Caribbean. Their new feature, Caribbean Beach, will take readers across the shorelines of the region, from the pink sands of Bermuda to the black-sand beaches of St Lucia. 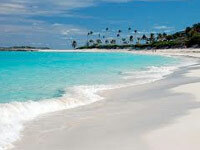 Their inaugural Caribbean Beach feature is on Cabbage Beach on Paradise Island in The Bahamas. Cabbage Beach is one of their top 10 beaches for 2013. The trick to enjoying this beach, as all the locals know, is to head down the beach, away from the Atlantis and Riu resorts, past the One & Only Ocean Club and the Paradise Island Beach Club. That’s where the best beach experience can be found.